Powers/Abilities: Boot was regenerated by hi-tech magic from the point of death by Vorin and became a psionically augmented cyborg. He has athlete agility and speed, while his durability, reflexes and stamina are all enhanced human. He has Class 10 strength (see comments). He and his fellow Shadow Riders have a radically reduced need for sleep. He is equipped with cyborg arms which can be removed and replaced with his original organic upper limbs; different versions of these arms include projectile weapons, lock picks, etc. These arms are highly durable, reflecting gunfire from Mys-Tech's security guards. For some unrevealed reason, Mys-Tech's scanners had difficulty scanning him (see comments). He apparently has untapped psi powers. Prior to being a cyborg, he had athletic agility, endurance, reflexes, speed, strength and stamina during his time as a Warhead. His strength may have been peak human (see comments). In addition, as a former Warhead he is an experienced fighter. He is an excellent hand-to-hand combat, and skilled with conventional and unconventional ballistic weaponry. He is experienced at visiting alien environments. He was Malkuth's technician and computer expert, and has an advanced understanding of electronics and weaponry. He has learned even more about electronics from Vorin. He is a skilled motorcycle rider, at least during his time as a Shadow Rider. Being field leader of the Shadow Riders and a Night Club owner suggests he has some leadership skills. Boot wears mystically enhanced battle armor which includes a personal force shield. He has his own Shadow Bike, created of unique fluid metal by Vorin (see comments). Boot is known to make jokes during attacks, possibly in an effort to diffuse the tension of himself and his teammates. Che described him as having a "devil may care attitude" during their time as Warheads. Frequently so, according to Boot himself. Weight: 360 lbs. (see comments). (John Freeman's Boot Character Profile) - The child that would grow up to become Boot was born in South London. He never married, and had no known criminal record. The extent of his education is unknown, but he became well versed in electronics. At some point he became the owner of a night club in London, though exactly when is unclear (see comments). (John Freeman's Shadow Riders Guide) - In addition to the club in Central London, he owned a pub in Northern England, which he won in a "game," although what sort of game he has never explained. These venues catered for the best in rock and metal. (Shadow Riders#1/2) - Boot was formerly a mercenary employed by Mys-Tech in their Warheads division, where he and other members would travel through wormholes in time and space in order to acquire powerful weapons and technology. (Shadow Riders#3 (fb) - BTS) - Boot traveled to Sharin, Vorin's home world, during his Warheads training . He was responsible for the deaths of some of its populace, something he would later come to regret during his time as a Shadow Rider. At the time, he believed the people on Sharin were androids due to Mys-Tech's lies. (Shadow Riders#2 (fb) - BTS) - During his time as a Warhead, Boot met fellow Mys-Tech employee Gadafel, a connoisseur with appetites for psychic energies. Boot never liked Gadafel. (Shadow Riders#1/2) - Boot served in Malkuth troop, under the command of the man known as Che. Under cover of an archeological expedition in Egypt, Malkuth troop prepared to make a jump. Most of their equipment had been dropped in a dune and was full of sand, and Che was insistent on safety checks. Boot joked that an equipment failure would make things more interesting. During the mission, the troop encountered a time traveler known as Cable when they appeared within his base and fought his security robots. Che ordered a retreat, with Boot objecting. Ultimately Boot was shot by Cable, mortally wounded, and knocked back through the wormhole. Boot was recovered by the extraterrestrial sorcerer known as Vorin, who revived him and made a few improvements to his human form. Vorin then left with Boot, planning to make a few more mechanical adjustments. (Shadow Riders#1 (fb) - BTS) - Once Boot's transformation was complete, Vorin convinced him to abandon the evil of Mys-Tech. Boot joined Vorin's group of Shadow Riders, each having joined under similar circumstances. (John Freeman's Shadow Riders Guide) - A psionically augmented cyborg, Boot became the strong arm of the team. In his second life, he liked nothing better than to push the envelope, to see what he was capable of in the knowledge that there is something beyond life. This attitude earned him the respect and fierce loyalty of the bikers who work for him. He was in his mid-twenties upon joining the Shadow Riders. The fact that he also managed several bands who regularly tour Britain and beyond has often been used as a cover for the Shadow Rider's activities. (Shadow Riders#1 (fb) - BTS) - The energies of Mathew Ryan, aka Abadon, affected the defensive perimeter of Mys-Tech HQ. Boot took advantage and rode the carrier wave in there like "a dart to a bullseye" in order to investigate. (Shadow Riders#1) - Boot met Cable for a second time atop the Museum of Pagan Antiquities. They fought, and Boot charged at Cable. They both fell into a time portal and arrived back at Cable's secret base. Boot recognized his surroundings and, finding things a bit too weird, jumped back through the portal. Cable followed, and their fight drew the attention of Mys-Tech security. Boot shot and killed one of the team sent to stop them, a man called Arnold Coltrane. Arnold became the Shadow Rider's latest recruit, as Vorin arrived and ordered Boot to retrieve the mans charred remains. Boot and Vorin escaped via transit beam with Arnold's body, while Cable made his own escape. Back at the Shadow Riders base, Boot and his teammates watched as Vorin began the process of altering and reviving Arnold. Some hours later, they detected more energy readings from Mys-Tech HQ. The team gathered to infiltrate their enemies base with Arnold joining them as Grunt. (Shadow Riders#2) - Boot led the team along a motorway in northern England at midnight on their Shadow Bikes, overtaking a police officer as they sped towards London. When Vorin activated the transit beam, they were transported to Mys-Tech HQ leaving the (very confused) police man behind. On arriving inside Mys-Tech HQ, Roadie got a fix upon the energy readings they were investigating and identified Mathew Ryan as the source. While Stranger used his powers to infiltrate the complex even further, Boot, and Grunt engaged Mys-Tech security teams. Meanwhile, Roadie set about liberating Ryan. Confused by what was going on, Ryan tried to summon help. His powers transported Ghost Rider and a group of unfriendly demons into the room. Ghost Rider joined forces with Boot and Grunt against the demons and Mys-Tech's security. Eventually, Ryan dispersed the demons. Just then, Stranger returned, and the team escaped via transit beam, taking Ryan and Ghost Rider with them. Ghost Rider was sent home by Vorin. Boot and Grunt had a sparring session soon afterwards while Vorin and Roadie examined Ryan and Stranger assessed data stolen from Mys-Tech during the raid. (Shadow Riders#3) - Ryan had a nightmare of Boot and the others causing his powers to go wild. When he woke, Boot and the others arrived to investigate. Vorin spoke to Ryan about the information Stranger had recovered and his plans to return to his home planet of Sharin. Boot was suspicious that the information had been all too conveniently found during their raid on Mys-Tech HQ and warned Vorin, suggesting it was a trap. Vorin was insistent on returning, however. (Shadow Riders#3 - BTS) - Boot went out for a ride on his Shadow Bike and brought some cans. (Shadow Riders#3) - Boot returned, pulling up at Vorin's cottage. He greeted Joel, the man who Vorin kept around seemingly to tend to the grounds, and then went inside. He passed through Vorin's holograms into the secret base below the cottage. Picking up on the growing connection between Ryan and Roadie, Grunt walked past with a smile. Vorin, meanwhile, was still discussing plans to return to Sharin. Boot did try to warn Vorin that his home planet wouldn't be as he left it, but was ignored. After an hours preparation, the team left and were unexpectedly joined by Cable. Boot explained the situation to Cable as best he could. Vorin, meanwhile, was devastated to see the ruins of his home world. Boot admitted that he knew what had happened here due to his time as a Warhead, and apologized. Vorin was understandably angry, but their conversation was interrupted by the attack of the Slaughterhouse Six. Initially unable to affect the creatures with their weapons, they recalibrated them to phase over the widest possible electromagnetic scale. Boot, Cable and Stranger blasted one of the creatures, successfully injuring it. Their victory was short-lived, however, as Mathew Ryan was turned against them by Porlock. Mathew reverted to his Abadon personality, and attacked Boot, Cable, and the Shadow Riders with his energies and then bound them mystically. While they recovered, Porlock ranted about his plans and then ordered Abadon to kill them. (Shadow Riders#4) - Abadon started by attacking Vorin, but was interrupted when Goodfellow revealed himself and attacked. Roadie and Stranger found a way to disrupt their bonds. Once free, Boot ordered Goodfellow to power leech one of the Slaughterhouse Six. Goodfellow then transferred the creatures time phasing power to Boot, who used it to hide himself and his companions in safety inside a time bubble. Cable grabbed Boot's former teammate, who was there with Porlock. Che was hidden along with the others, preventing Abadon from realizing that he was secretly aiding Cable. While they recuperated and prepared to attack Abadon, Porlock was having troubles of his own with the entity. Abadon had turned on its supposed master, but before it could do Porlock any lasting harm, Boot and his companions attacked. They managed to travel back to Earth using the wormhole opened by Mys-Tech, but Abadon reached through the wormhole and grabbed Vorin. Vorin closed the portal with his magic and was nearly pulled back in along with Abadon. Fortunately, Boot reached in and pulled Vorin free. As Cable prepared to bodyslide them to safety, Che was blasted by Mys-Tech troops guarding the other side of the wormhole. While Vorin revived Che, Boot and the others relaxed in the recreation center at the Shadow Rider base. After an hour, Che was introduced in his new heavily mutated form. Boot apologized to Vorin again for his role in the devastation on Sharin. Vorin, in turn, forgave Boot, and thanked him for saving his life. As Cable bade them farewell, the Shadow Riders welcomed Che to the group and swore to take the fight back to Mys-Tech. Comments: Created by John Freeman, Brian Williamson, and Ross Dearsley. Boot and the rest of the Shadow Riders were created as part of Marvel UK, which hasn't shown any activity in the last several years. It is unclear whether any of those characters will appear again. Boot's real name was revealed in Marvel Atlas#1. In updating this profile to match current formats I've had the opportunity to add information from various files shared by John Freeman. Boot was mentioned in a PDF on the Warheads. In a Tree of Life diagram, Boot was shown to stand in the Geburah position when preparing for Wormhole travel with Malkuth troop. He was described as a technician and computer expert and represented "strength." These match to his skill set in a Shadow Rider's profile John provided. With him representing "strength" in the Malkuth troop I have speculated that perhaps he had peak human strength. Certainly, considering the sheer amount of training the Warheads received, and his experience of surviving missions in harsh alien environments, he would've been very athletic even prior to his resurrection. The profile gave his height, weight and hair details. For "eyes" it said "check with Stuart", referring to Stuart Bartlett, the editor of Shadow Riders. I can't pick out an eye color from the comics either, unfortunately. The weight stat given in the profile was 350 lbs., but text in the series itself gives it as 360lbs. I've listed that above rather than contradict what was shown in the comics. Though lets face it, it's not unheard of for peoples' weight to fluctuate. Especially cybernetic people with interchangeable arms! For his strength, John's profile commented that this should almost match any existing guide for Cable and that if there wasn't already a guide for Cable then to set Boot's strength at Class 10. Cable was indeed listed at Class 10 in the OhotMU Master Edition profile he received. Exactly where in that range (2 to 10 tons as per the Master Edition) either Cable or Boot fall is up for discussion. John's profile also tells us that Boot has no known criminal record, his marital status is single, as well as being the source for the levels of his agility, strength, etc, and some of the details on his powers and skills. It also lists his intelligence as "normal," though looking at all his technical knowledge I think under the current OhotMU rankings he would be a strong contender for "learned" (a category which didn't exist using the Master Edition system, which is what was used for Overkill profiles). John's Shadow Riders' profiles all seem to be in the same format as other Overkill profiles, and presumably would've seen print in that magazine if it had continued publication. 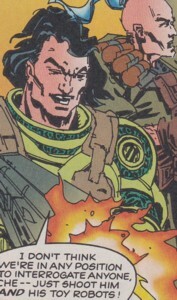 The Overkill profiles for the Warheads also mention mystically enhanced body armor and personal force fields, so presumably Boot retained these and the look was modified (he doesn't appear to have the same armor as he did as a Warhead) or new versions were patterned after the Warheads equipment. The Shadow Riders' technology is mostly either created by Vorin or stolen from Mys-Tech, as referenced in several of John's profiles on the team. The body armor and force field don't really get a look in in the Shadow Riders series, but in Warheads there are a couple of instances of them using forcefields. When active they are capable of withstanding heavy artillery and powerful energy blasts. They aren't used frequently though, suggesting perhaps that they have a limited power supply and tend to be only used if the situation desperately calls for it. The actual armor doesn't appear highly durable prompting me to suspect that magical enhancement provides a limited resistance to magical attacks. I plan to do a more in depth write up on Warheads equipment for this site when I get around to the Warheads own series. I will also cover the Shadow Bikes in the group profile update and expansion. Regarding why Mys-Tech had trouble scanning him, I dare say the Shadow Riders didn't want them finding out Boot was a former Warhead brought back from the dead. No stealth powers are mentioned in John's profiles, so I imagine this could've been something laid on for the mission by Vorin using either his tech or majic to mask Boot's identity from the scanners in some way. The night club he owns which is mentioned in both John's profile and shadow riders guide, and the northern pub, both sound like my kind of place. I have no idea when he acquired these though. I've written the profile as though it stems from before his time as a Shadow Rider and his time with the Warheads, but it could've happened during either of those periods. It seems unlikely to me that he'd have had much time to start a business while adjusting to life as a Shadow Rider, though I guess the club could've been bought with his earnings as a Warhead. They are supposed to get quite highly rewarded considering the massive risks they take. Again, thanks to John for all this wonderful information. According to the second story in Shadow Riders #1, Boot's fateful last mission with Malkuth took place six months before the action in the main strip. I've not referenced that in the profile above due to Marvel's sliding timescale. But it shows that Boot hadn't been a Shadow Rider for very long. In closing, Boot clearly likes his rock music, a few beers, and watching a bit of science fiction (Star Trek, Red Dwarf, etc). He sounds like the kind of guy I should know! Profile by Snood, updated and expanded by Changeling.